Guests can connect to Wi-Fi for free in cheerful rooms with full kitchens at the non-smoking TownePlace Suites by Marriott Champaign Urbana/Campustown where breakfasts are free each morning. With a fully equipped kitchen in each of its 95 non-smoking suites the six-floor TownePlace Suites by Marriott Champaign Urbana/Campustown feels like home. 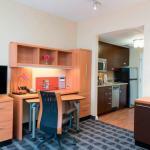 Layouts range from studios to one-bedroom suites and all feature free Wi-Fi flat-panel TVs seating areas and hairdryers. Corporate guests connect with the office in the business center while active guests stay fit in the exercise room. Keep the kids entertained in the indoor pool and pick up necessities at the small market. Don't miss the free breakfast each morning. There's also a 24-hour front desk and a guest laundry. Pets are allowed and parking is available both for an extra fee. Airport shuttle service is free. The hotel is four miles from the intersection of interstates 57 and 74 and just a block from the University of Illinois at Urbana-Champaign. The charming brick storefronts and restaurants of downtown Champaign are a mile from the hotel as is the Amtrak Station. Within a few miles guests can visit the Virginia Theatre Krannert Art Museum and Larry Kanfer Photography Gallery. There are four golf courses within 20 minutes and other outings might include Crystal Lake Park less than two miles away and Meadowbrook Park three miles by car. Central Illinois Regional Airport is 50 miles away.